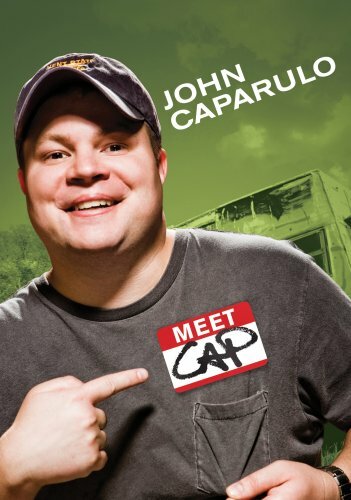 Order ‘Meet Cap’ by comedian John Caparulo, available right now at a great price by clicking on the DVD cover above! Unfunny times demand the most from those among us with a sense of humor. High unemployment, falling wages, rampant homelessness, political divisions, religious intolerance, wars, natural disasters… horrible, unfunny stuff.But every year I look around and am reminded this is the same stuff we endured last year. The names change, the issues vary, but the only really difference is that I’m a year older and I need a good laugh more than ever.And now I’ve put a ton of pressure on my guest, John Caparulo. But he can handle it. Every night, in venues large and small, he mounts a stage somewhere in America and assumes an offensive stance in the face of sometimes hostile enemy fire—you know, hecklers. Caparulo is a comedian with a rising profile, thanks to regular appearances on E!’s “Chelsea Lately,” “The Tonight Show” and a spot on the Blue Collar Comedy: The Next Generation tour. He’s a funny guy, probably closer to Larry the Cable Guy than Jeff Foxworthy in style — which is not a bad position in this country.